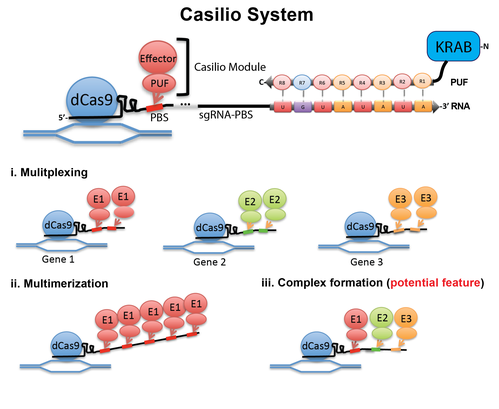 The Albert Cheng and Haoyi Wang labs at The Jackson Laboratory (JAX) have developed a CRISPR/Cas platform called Casilio , which is a hybrid system combining d Cas 9 and the RNA-binding domain from Pum ilio . The system uses a modified sgRNA, referred to as sgRNA-PBS, that has different numbers of 8-mer P UF b inding s ites (PBS). These PUF-binding sites recruit PUF (Pumilio/FBF) domains that are fused to an effector, like those for epigenetic regulation, chromosomal labeling, and gene regulation. This is an alternate strategy to techniques that fuse effector domains to dCas9. PUF can be programmed to recognize virtually any 8-mer RNA sequences. This feature enables Casilio to multiplex and mulitmerize effectors at distinct loci. It can also potentially recruit different proteins on a single sgRNA allowing the study of protein complexes. Due to the 8-mer RNA sequence space provided by the PUF code, it is possible to construct approximately 60,000 orthogonal modules that can function independently in cells. In the future, modules tethering different fusion proteins can be assigned a unique PUF/PBS pairing. The Cheng lab will maintain a Casilio module database with links to resources and information. Researchers can obtain the desired modules to perform their functional genomic experiments by constructing the matching sgRNA-PBS. 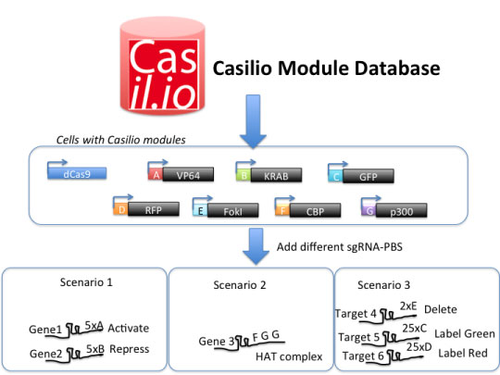 Since Casilio modules are orthogonal, researchers can use any combinations of modules as is, allowing plug-and-play application of Casilio in functional genomics studies. Overview of Casilio workflow. The Cheng Lab is maintaining a Casilio website containing a module database where researchers can search for available modules, as well as find information on the Casilio platform. Casilio: a versatile CRISPR-Cas9-Pumilio hybrid for gene regulation and genomic labeling. Cheng AW, Jillette N, Lee P, Plaskon D, Fujiwara Y, Wang W, Taghbalout A, Wang H. Cell Res. 2016 Feb;26(2):254-7. Open Access Link. PubMed PMID: 26768771 . For Cas9, use a nuclease-deficient S. pyogenes Cas9 with D10A and H840A mutations (dCas9). Addgene has many dCas9 plasmids available. pAC1445 – pmax-dCas9– A transient expression vector for dCas9. A single-guide RNA (sgRNA) appended with multiple copies of Pumilio binding sites (PBS). A fusion protein consisting of effector domain(s) fused with a PUF domain programmed to recognize a specific 8-mer PBS.